This is CME on ReachMD. 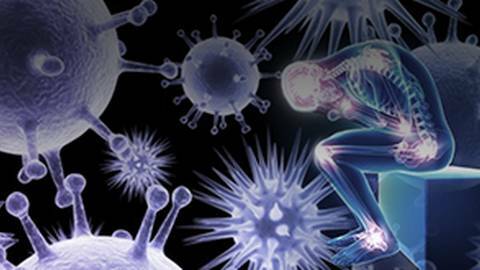 This CME activity titled Expert Review of Case Studies for Autoantibody Testing for Autoimmune Diseases, is brought to you by Medtelligence and The Postgraduate Institute for Medicine, and supported by an educational grant from Quest Diagnostics. Hi, I’m Bob Baldor. I’m Professor and Senior Vice-Chair of Family Medicine and Community Health at the University of Massachusetts Medical Center in Worcester, Massachusetts. And I’m Chad Johr, Assistant Professor of Clinical Medicine in the Division of Rheumatology at the University of Pennsylvania in Philadelphia. We’ll be discussing interesting and informative cases that focus on autoantibody testing for autoimmune diseases, or more precisely, connective tissue diseases. Our purpose here is to provide you with clinically relevant cases discussing how autoantibody testing, such as the ANA, may be used in the primary care setting to diagnose these disorders. So, Dr. Baldor, why don’t you start? What case are you going to present first? All right, well thanks, Chad. First of all, I saw a woman, she was a 55-year-old, came in, chief complaint of gradually worsening joint pain. She had some swelling and stiffness of her hands and wrist, been going on for the last few months. She reported that the stiffness was worse in the morning, although slowly improved after an hour or so of activity or after a hot shower, but really what brought her in was she was having some more trouble opening jars, and she does clerical work, and it was harder for her to keep up with her keyboarding at work. Review of systems was really unremarkable, although she did have some mild dyspnea on exertion, which I thought was interesting. Her past medical history was a little bit, as you would expect of somebody this age, she was diagnosed with type 2 diabetes about 3 years ago, and at that time she decided to pursue a little healthier lifestyle. She started exercising and losing weight and had been controlling her diabetes that way. She also had been a smoker, about 25-pack year history, but had quit smoking at that time as well. She had a couple of normal pregnancies in the past but no history of miscarriages. Her family history was remarkable though for her grandmother having had some rheumatism, and her mother had developed some joint problems in her hands in her 40s. Her father, unfortunately, had died of an MI in his 50s but no clear rheumatologic joint problems as she was aware of. So pretty much that’s the extent of her history. I did examine her, and she had some bilateral swelling and some tenderness of her PIP and MCP joints. Her grip strength was somewhat decreased. As she said, she was having some trouble opening jars, and her first formation was limited. She could touch her fingertips to her palms, but she couldn’t sort of bury her nails, which is interesting to me. She had some mild palmar erythema but no other skin rashes, and I didn’t detect any nail pitting either. That’s an interesting case, Bob. Based on the history and physical exam, what did you suspect, and why? Well, I was thinking rheumatoid arthritis, and mostly because of the joints that were involved. Let’s review the evaluation for suspected rheumatoid arthritis. So really, when you think someone may have rheumatoid arthritis, you want to do a thorough medical history with particular attention to joint pain, stiffness and associative functional difficulties. Complete examination: You want to look for evidence of synovitis, of joint swelling, tenderness, limited joint motion, extra-articular disease manifestations that you might see in rheumatoid arthritis, perhaps in the lungs and others, and signs of diseases included in the differential diagnosis. It’s important to do basic and selected laboratory testing, including assays for acute phase reactants like sed rate, CRP, rheumatoid factor, CCP antibodies, and an ANA, mostly to look into other possibilities and what’s on the differential. I like to get bilateral radiographs of the hands—you can get separate ones of the wrist if your hand radiographs won’t include the wrists—and the feet. And sometimes we even consider doing an arthrocentesis to try to—mainly to rule out other things of the differential. Now we know that rheumatoid arthritis is a systemic disease with a predilection for the joints, and of course it can involve the joints, but it can also involve other organ systems. You can have inflammation of the eye, like scleritis. There can be eye dryness, especially when patients have associated Sjögren’s syndrome or keratoconjunctivitis. You can have problems with the pleura in the lungs. You can have effusions. There can be fibrosis of the lungs, interstitial lung disease. Lung nodules are not that uncommon. Patients can have lymph node involvement with reactive lymphadenopathy, heart involvement with pericardial, like the pericardial effusions. Patients sometimes can have splenomegaly, though it’s not something we see frequently. In the old days when people had lots of unchecked inflammation, before we had good treatments, folks could even get amyloidosis that could affect kidneys mainly and sometimes the GI tract, but this is something we pretty much never see anymore. Patients can have bone marrow involvement with anemia, thrombocytosis in some cases. People can have muscle wasting, skin thinning, and ulceration in some cases with vasculitis, for instance, or sometimes from treatment from prednisone. And the nervous system can be involved. People can have peripheral neuropathy, not very common in RA but certainly with certain medicines and if people have vasculitis associated with RA, which thankfully isn’t very common anymore. So, Bob, tell me, did you do any routine lab tests for this case? Yes, I did. I got some routine labs, and interestingly enough, her CBC was a bit off. She had a normocytic anemia, a little mild thrombocytosis, although her white count was okay. As suspected, her ESR and CRP were elevated. Her ESR was 35, and her CRP was 5, normal being less than 3 on that. I did check some other labs, her LFTs and urinalysis, and those were both normal, both within normal limits, so no concern there. I did do some additional testing, and having had that baseline, I felt it was important to get a rheumatoid factor. I did CCP antibodies as well along with one of these newer tests, the 14-3-3 eta testing, and my understanding is that combination gives the highest sensitivity to detect rheumatoid arthritis, and all of her tests were positive. So, if you look at this, if you just get a rheumatoid factor, the sensitivity for RA is 57%. If you get the rheumatoid factor with the CCP antibodies, it goes up to 72%. If you add on the 14-3-3 eta, it rises to 78% for sensitivity here as looking at this. At least that’s what the tests have shown as part of this. So I got those as well for her, and these came back all positive in the significant titers. All right, well that’s a good approach. However, this 14-3-3 eta testing, I don’t know how wildly used that is. Can you tell me a little bit more about it? Well, it is a relatively newer test for rheumatoid arthritis, and patients with rheumatoid arthritis do have elevated levels of this protein in their blood. And while it’s not considered a standard test, obviously you can be using it with the other tests for helping with a diagnosis. As I indicated, it does increase your sensitivity around the testing. But I think it’s going to be really interesting to see how this test plays out, as more importantly, it seems to be a marker for disease severity. So the studies have shown that if you have a positive 14-3-3 eta testing with higher titers at baseline, those patients will go on to have a higher likelihood of progressive joint disease over the next 5 years, where if you had a persistently negative 14-3-3 eta value, you’ll have better outcomes and more likely to be in remission going forward, so this may be something that we’ll be finding more useful to help us to determine further therapy for patients as we think about their treatment and how to follow them with it. It’s nice to have a marker for disease severity. Finally, I did use the American College of Rheumatology Classification Criteria for Rheumatoid Arthritis, and I think it’s important just to review those. I think they’re very... They have been very helpful for me. And these are from 2010, so there’s nothing really new here, but at least for in primary care, when you’re seeing somebody and trying to decide, boy, do they have rheumatoid arthritis or not, these criteria refer you to 4 classifications. And so this isn’t the diagnostic criteria per se, but it is helpful, and it indicates, well, how many joints do you have involved, how long has this individual had synovitis, the impact of the serology and whether you have positive acute phase reactants. And so my patient actually had a score of 8 as I add this up. In the criteria, it’s considered if you are above 6 that that’s consistent with RA. So she had joint involvement. She had 8 small joints that were involved. That gives her 3 points. Her symptoms lasted more than 6 weeks. That gives her another point. Her acute phase reactions were all positive. That was ESR and the CRP as you had indicated. That’s another point. And, of course, the serologies, rheumatoid factor and the CCP antibodies are both positive, significant titers, so there’s another 3 points. So she had 8 points with that, and certainly it made sense to me that that’s what was going on with her. All right, Bob, so let me recap this interesting case of this 55-year-old woman. I mean, I’d just like to say that this is a pretty classic case in many respects of rheumatoid arthritis. You have the chronicity. This has been going on for several months. It’s certainly inflammatory. This patient has significant joint stiffness in the morning, and they have swelling of many joints. The number of joints is very much in line with rheumatoid arthritis. With our rheumatoid patients, these people are often very much polyarticular synovitis, many joints involved, and you have swelling of all the, pretty much all the PIP. Frequently, patients will have family history though. It certainly doesn’t rule it out. And then we go on with the laboratory testing, and then we see that there’s also evidence of positive laboratory testing as well that really kind of helps us put this all together. And so I’d say that this is a pretty typical case of rheumatoid. I’ve seen, boy, dozens of cases like this, and again, like you mentioned in the case, catching it early, that’s really important, so I applaud you on that and I think it’s great. Well, thank you, and yes, I do have another case, really somewhat similar, although a much younger woman. She’s 24 years old, chief complaint about the same, gradually worsening joint pain, some swelling and stiffness in her hands and her wrists over the last couple of months. She had a little improvement when she took some over-the-counter NSAIDs for this. However, given her age, review of systems, past medical history really were benign, not much going on. Family history remarkable for her mother having had an overactive thyroid condition, but she wasn’t quite clear what that was about. This patient was a nonsmoker, social drinker, denied other substances. It turns out she was a graduate student, so she would drink 3 to 4 cups of coffee a day to just kind of help keep up with her studies. What was interesting to me though was her exam. She did have tenderness to palpation of her wrists, MCP and PIP joints, and her HEENT exam was remarkable for some painless oral ulcers, and she had a raised erythematous facial rash over her cheeks and little bit in the V area of her chest. Remainder of her exam was unremarkable except I detected some trace pedal edema. So because of that, I did some routine labs. I was somewhat concerned about the pedal edema, so I did get a comprehensive metabolic panel and a urinalysis, and the CMP was normal, although her albumen was a little bit low, and sure enough she had 2+ proteinuria in her urine. Her inflammatory markers were up. Sed rate was 30. Her CRP was 4.5, and that was mg/dL with a normal less than 3. Her CBC did show a mild normocytic anemia, and she had some modest, a little bit of mild leukopenia as well with that. All right, Bob, that’s an interesting case. I guess, given the history, the exam findings and the lab results, the most likely diagnosis was systemic lupus erythematosus, or SLE. Well, that was my suspicion, especially with that facial rash. Well, I agree, Bob. And when I’m thinking of lupus, there are certain things that kind of set me off and kind of lead me down that road. Sometimes when people have the classic malar rash or the butterfly rash on the face, it makes me think of lupus. I think of lupus especially in younger women who present with inflammatory joint disease and joint swelling and also, of course, if there’s a family history. So with lupus, the diagnosis is difficult to make, and it’s useful to use classification criteria to help guide us, and so basically, we can use a SLICC Revised Criteria. When you look at the SLICC Revised Criteria, there’s kind of 2 sets of criteria, clinical criteria and immunologic criteria, and you have to have at least 4 criteria, one being clinical at the minimum and one being immunologic. So if we look at these one by one, the clinical criteria, acute lupus rash, chronic lupus rash, oral ulcer, alopecia, arthritis, serositis, renal disorder, neurologic disorder, of which there are many in lupus, hemolytic anemia, which we frequently see in our lupus patients, leukopenia or lymphopenia—and I’d like to point out that sometimes patients have a normal white blood cell count but they’re lymphopenic, so it’s important to look at the absolute lymphocyte count as well as just the overall white count—and thrombocytopenia. And the immunologic criteria, there are 6 here. We have a positive antinuclear antibody, a positive anti double-stranded DNA antibody, positive anti-Smith antibody, anticardiolipin antibody, decreased complement levels, and also a direct Coomb’s test. Well, I think that, as I say, that’s great, and she certainly did meet some of this criteria. So, for the ANA testing that I did, it did come back positive. She had a titer of greater than 1:320; and understand that’s important to have a high titer really to say the ANA is truly positive. The pattern was homogeneous. And I’ve been following the idea of really tiered testing for subserology once the ANA is positive, and in this case, if we think about tiered testing, really the first tier of testing is to do those antibodies you talked about: double-stranded DNA, the anti-Smith; the chromatin and RNP come through as part of that tier 1 as well. And what’s really interesting to me is that the Smith and the double-stranded DNA are highly specific for SLE. The Smith is 99% specific, and the double-stranded DNA is 95% specific, so when I did that with a tier 1 testing and those came up positive, I really felt that I had my diagnosis there of SLT and no need to go along further with any further tiering testing of the ANA at that point. And again, I didn’t feel comfortable treating her, especially with the renal involvement that I was seeing already, so I referred her to my rheumatologist colleague here fairly quickly at that point. And it was kind of a tough diagnosis to give her. She was only 24 and to sort of say, “Wow, you’ve got lupus here that we’re dealing with,” and so it look a little time to explain that to her, but I think she felt reassured, and I was able to get her in fairly quickly to see a rheumatologist to start treatment early on. Well, Bob, that’s a great case presentation. I hope listeners will really find that useful. Well, thank you, Chad. And I’m wondering, do you have any interesting cases you’d like to discuss to bring forward that might help us think through some of these other interesting rheumatologic conditions? Absolutely, I do. Thanks for asking. All right, Bob, well my case is a 45-year-old woman who presents to the office complaining of 2 years of dry eyes, dry mouth and fatigue, that have worsened over the past few months. Always with a water bottle at her side, she drinks water frequently throughout the day and uses artificial tears twice a day for the feeling of having sand in her eyes. As a school teacher, she finds it more and more difficult to make it through the day due to her dryness and disabling fatigue. She also notes several months of joint and muscle aches, for which she takes ibuprofen as needed, yet this only helps marginally. She was told by a coworker that she may have Sjögren’s syndrome. Wow, a coworker, it’s amazing. I assume she must have Googled her symptoms. So tell me a little bit more about Sjögren’s syndrome. Well, Sjögren’s syndrome is a systemic autoimmune disease. It’s characterized by dry eyes, dry mouth, fatigue and musculoskeletal pain. Bob, anyone can get Sjögren’s syndrome. It doesn’t matter your race, religion, age. It’s most common in women compared to men; though I have seen plenty of male patients with Sjögren’s, but it occurs like 9:1 women over men, similar to lupus and some of our other autoimmune diseases that we see in the rheumatology clinic. It’s most common in women in their 30s, 40s, 50s, so the onset is a little bit older than lupus. Lupus we often see more commonly in women, younger women. Usually, we say women of childbearing age, you know, like teens, 20s and 30s more commonly. You know, those symptoms are somewhat nonspecific. I guess this must be a lot more common than I’m aware. Yes, you know, that’s the thing. Everyone has heard of lupus, and there is a lot of patients and even some providers who really aren’t clear as to what Sjögren’s syndrome is, but it’s now thought to be the second most common autoimmune connective tissue disease after rheumatoid arthritis, even more common than lupus. It’s thought to affect as many as 1:100 patients, somewhere between there, and maybe more conservative estimates would be 1:1000 people, but, you know, it is a lot more common than we think. The main symptoms of Sjögren’s syndrome, as I mentioned and as was kind of pointed out in the case, is going to be dryness, and it could be dryness of the whole body, but mainly people complain of very dry eyes, very dry mouth. This can be incredibly disabling. I have a lot of patients who really can’t sleep; they really can’t function very well because they are so dry. It drives them crazy. People often have fatigue that’s often very disabling as well. This is a big complaint and also difficult to deal with. Patients frequently have arthralgias and myalgias. Sometimes they have arthritis, like you see in rheumatoid arthritis and lupus. Thankfully, it’s not typically damaging the joints, but more commonly people just have joint and muscle aches. And frequently people have recurrent and sometimes persistent salivary gland swelling, which can also be troubling. It’s important to note that this disease, like many of the diseases we deal with in rheumatology, is highly variable, so although I have some patients who have no dryness at all, most patients do have that. I have some patients who have minimal fatigue. I have others who have crippling fatigue. Some have joint swelling, some don’t, so it’s really, you know, you can’t say, “I have Sjögren’s syndrome,” or if I diagnose someone with Sjögren’s syndrome, you can’t just say, “Okay, what’s going to happen to me, and how is it going to affect me?” because I really don’t know. Everyone is different. So, are there some ACR classification criteria for Sjögren’s like the other diseases we’ve been talking about? So, diagnosing Sjögren’s syndrome is tricky. It’s really based on expert opinion, but obviously, that’s difficult, because what if one expert says one thing and another says another, so it’s useful, actually, to follow the classification criteria just like with lupus and RA to help guide decision-making and diagnosis. So if we look at the ACR-EULAR 2016 Classification Criteria, you need to have 2 out of 4 different criteria to be classified as a Sjögren’s syndrome patient in a study. And I like to tell patients, “If you can be classified into the Sjögren’s arm of a study, then you probably have Sjögren’s syndrome.” So if we look at the 4 different criteria, one is objective signs of eye dryness, such as with a Schirmer test or ocular staining score test, which is done by an eye doctor. Another is objective signs of dry mouth, such as a whole mouth unstimulated sialometry test. The third criteria is a positive SSA antibody or positive Ro antibody is another way to put that. And the fourth criterion is going to be a positive lip biopsy with a focus score of 1 or more. It’s important no note that of these 4 criteria, at least one of them has to be consistent with autoimmunity, which would be the positive SSA test or the positive lip biopsy. So you need 2 of the 4 criteria and one has to be positive, and one of them has to be either the positive SSA or a positive lip biopsy. And the reason for that, Bob, is that Sjögren’s syndrome is an autoimmune disease, and so you can’t just have dryness but no evidence of autoimmunity, so the positive SSA or the positive lip biopsy, those are the 2 tests of autoimmunity. I talked earlier about the ANA tiered testing and with a positive ANA tier 1, and if that’s negative, you go on to tier 2, and the tier 2 subserologies really include those SSA and SSB as part of that, and so if those are positive, that gives you the sense this is Sjögren’s as part of what you’re doing. By the way, I must say I’m not sure I want people sticking paper in my eyes there for 15 minutes. So you diagnosed him with Sjögren’s. How do you best treat this condition? Well, really, the treatment for Sjögren’s is going to be tailored to the individual patient. There’s no one-size-fits-all treatment. And a lot of times people will say, “Well, I have Sjögren’s, so how do you treat me?” And I say, “Well, you have to tell me, you know, I have to figure out what it is and how this is affecting you, and then I can better kind of tailor treatment to your individual case.” And so one thing you can do for the dryness is just to try to avoid medications and products that can cause dryness. A lot of people don’t realize that your usual toothpaste that you buy just at any drugstore has drying agents in it, So you want to avoid certain products that will lead to dryness—products with alcohol, like alcohol-containing mouthwashes. And also, a lot of medicines like antihistamines or, obviously, diuretics really can lead to dryness, and so medications that-- you have to look at the patient’s med list and maybe try to make substitutions or just cut out ones that lead to too much dryness, especially if the dryness is causing a lot of distress. Patients can also use artificial saliva and tears. And there’s even medicines that help stimulate the glands, Bob. So, Sjögren’s syndrome is really interesting for me to consider, you say some nonspecific complaints of fatigue and dry eyes and dry mouth. I see them not uncommonly. I think it’s time for me to begin thinking that maybe there’s Sjögren’s syndrome that’s part of that and underlying disease that’s there, and it’s much more common than I was aware of. I think about those criteria that you mentioned. Certainly, I’m going to have the clinical criteria, but I’ve not been doing a lot of testing for that, and I think that it makes sense to pursue looking at those Ro antibodies, as you call them the SSA and SSB testing, as part of the ANA testing. And again, I haven’t thought about doing that from the perspective of somebody coming in with a lot of dry eyes and dry mouth. And now being really aware of the more significant complications that you can get with this illness, I’m going to start looking for that more commonly and perhaps doing a few more referrals as well when I’m seeing those folks come in with that. I think it’s often times I pass along people with dry eyes and dry mouth just to the fact that they’re having some side effects to the medications they’re on, but that sounds like that may not always be the case. Do you have another case to present? Actually, I do. So my second case, Bob, is a 56-year-old female who’s had Sjögren’s syndrome now for 10 years, and she just moved to the area. She’s establishing care with you as her new primary care provider, and she also has systemic lupus, interstitial lung disease, chronic kidney disease and hypertension. She takes hydroxychloroquine for her joint pains and would like a refill. She is overdue for lab testing and needs to establish care with a new rheumatologist. Well, I’m glad she wants to establish care with a rheumatologist because she sounds a bit complicated to me. So you’re saying she’s got Sjögren’s and lupus, so how often do these run together? Yes, you know, it’s interesting. If you have one autoimmune disease, the chances of you developing another one is maybe as much as 1 in 3, and so it’s important to note in primary care that when you have patients who have one thing like autoimmune thyroid disease, you’ve got to keep an eye out for some other types of autoimmunity. Patients with Sjögren’s can develop concurrent rheumatoid, lupus, scleroderma—autoimmune thyroid disease is probably the most common—as well as others. Wow, and so I’m wondering, that would make me think that they’re probably at risk for some serious complications as well if you’re combining—having more than just 1 diagnosis there and more organ involvement, I would think. So, are there specific complications I should be thinking about with Sjögren’s besides the dry eyes and the dry mouth? Yes, well, you know, Bob, a lot of people don’t realize that the dryness, more than just a nuisance, can actually cause some serious damage. I mean, people can have vision loss from the eye dryness. It can be so severe, actually, it will affect your vision causing damage to the cornea. Patients frequent, I have plenty of patients who you’d be surprised have dentures. They have lost all their teeth, and they may be in your early 40s, just because of the dryness. They were people who were religious about brushing their teeth, they were always good about it, they were doing fine, and then all of a sudden they started having dryness of their eyes, dryness of their mouth, and within the next year or two, they are getting like 10 cavities a year. This is not uncommon to hear among Sjögren’s patients. It’s very frustrating to be losing your teeth even though you feel like you’re doing all you can to try to protect them. And then, you’re right, patients can have internal organ involvement. This is often a misunderstood disease even among rheumatologists. I mean, I’ve had patients come to me frustrated. They say, “My rheumatologist told me Sjögren’s doesn’t really affect your organs,” but there are complications. There are different organ systems that can be involved in Sjögren’s aside from just the musculoskeletal and the glands. I mean, it’s not uncommon for patients to have GI involvement. People can have autoimmune hepatitis, liver inflammation; neurologic organ system can be involved; patients can actually have CNS manifestations. I’ve had patients with transverse myelitis. People can have seizures and others, similar to lupus, and I think a lot of people don’t recognize. And they think of kind of autoimmune brain disease. Everyone thinks of lupus with seizures and stuff like that, but you don’t realize this can happen in Sjögren’s as well. It’s just not quite as common, although peripheral neuropathies can happen in as many as 1 in 4 or 1 in 5 Sjögren’s patients, so it’s really not uncommon to have patients complaining of numbness, tingling, which can even be pretty disabling. And on rare occasion, thankfully rare occasion, people can have vasculitis and footdrop and whatnot. Interstitial lung disease happens in a good number of Sjögren’s patients, so you have to look out for evidence of that with shortness of breath, cough, etc., and so we know that we can see other lung involvement such as obstructive lung disease can be more common. Patients more frequently will have sinus and respiratory tract infections due to just the dryness and more difficulty kind of clearing secretions. And then another organ system I’d like to mention—and thankfully it’s not common—maybe 5% or so of patients can have kidney involvement, although patients can have glomerulonephritis, which is probably what you might expect, I think, from a primary care standpoint. But interestingly, Sjögren’s patients more commonly have like an interstitial nephritis; so rather than acute interstitial nephritis that you might see with, say, like a reaction to antibiotics or NSAIDs, patients will have a chronic interstitial nephritis and kind of tubulointerstitial nephritis. And so we’ll see this sometimes in Sjögren’s patients, and this is the only rheumatologic connection I can think of with renal tubular acidosis. I actually have, Bob, 2 patients, believe it or not, who presented, and their Sjögren’s was diagnosed because they presented for weakness. They presented to an ER, and the initial pass with lab testing revealed a potassium of like 1, like a 1.2. Can you believe that? Yes, they come with a potassium like 1.5, and the ER doctor is like completely beside himself saying, “What’s going on here?” And they wind up getting renal involved and find out the patient’s also acidotic with a bicarb that’s like 12. Renal gets involved and diagnoses the patient with renal tubular acidosis. The patient has no other signs or symptoms of Sjögren’s at that point. Then they know it’s on the differential. They wind up testing ANA, SSA, SSB and all this kind of thing, and they wind up diagnosing the patient with Sjögren’s. So kidney involvement can happen in Sjögren’s patients and not just lupus patients, and so that’s one thing to keep in mind. That’s pretty interesting. Well, that’s fascinating. So this sounds like a pretty serious disorder, and certainly you want to attend to the specific organ involvement that is out there. and thankfully I have rheumatology colleagues nearby. Well, this is really terrific. I think that we’re just about out of time. I hope those of you listening have found this useful and helpful for you. I’ve certainly learned a lot myself. I’m Bob Baldor, Professor of Family Medicine at the University of Massachusetts Medical School in Worcester, Mass. And I’m Dr. Chad Johr, rheumatologist at the University of Pennsylvania. Thanks, Bob. I hope this has been helpful in assisting you, everybody out there listening, in the diagnosis of connective tissue diseases. The preceding activity was sponsored by Medtelligence, and the Postgraduate Institute for Medicine. To receive your free CME credit, or to download this activity, go to ReachMD.com/CME. This has been CME on ReachMD, Be Part of the Knowledge. Autoimmune experts discuss interesting and informative cases that focus on autoantibody testing for connective tissue diseases. This activity is supported by an independent educational grant from Quest Diagnostics. This activity has been designed to meet the educational needs of primary care and internal medicine physicians and other healthcare professionals involved in the care of patients with autoimmune diseases. There are no fees for participating and receiving CME credit for this activity. During the period April 27, 2018 through April 27, 2019, participants must read the learning objectives and faculty disclosures and study the educational activity. If you wish to receive acknowledgment for completing this activity, complete the activity, post-test and evaluation. Participants who successfully complete the activity, post-test, and evaluation will have a statement of credit made available immediately.